Monastir is a popular seaside resort, between medina and sandy beaches. It is a superb holiday destination but also the city of the Ribat, an imposing medieval fortress, and a jumping-off point to visit numerous historical sites. A famous coastal resort, Monastir offers a wide choice of activities: catamaran, jetski, massages in the spa, golf… or quite simply sunbathing on the sand. Visit the old town, haggle in the souks, stroll along the seafront facing the marina. Don’t skip a visit to the monument which gives the city its fame: its large ribat. This Middle Age fortress is a real labyrinth of courtyards and round and square towers. Don’t hesitate to climb to the top of its lookout tower: the view across the sea and the medina is breathtaking. Nearby, you can visit agricultural villages, small fishing ports, or Tunisia’s key historical sites such as Sousse, Kairouan, El Jem or Mahdia. 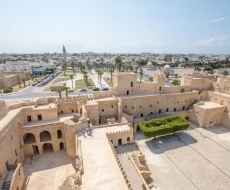 From the mausoleum of Bourguiba to the prestigious amphitheatre of El Jem by way of fortresses from the earliest days of Islam, visiting Monastir and the surrounding area will take you back through time. This medieval fortress was originally a small fort built to watch the coastline. Enlarged throughout the centuries, it then become an imposing monument and a prestigious centre of spiritual retreat for the Sufi mystics. Today, a section houses a museum displaying magnificent objects from the Middle Ages. The father of Tunisian independence, Habib Bourguiba, was born in Monastir. You can visit the mausoleum that he had built in the city of his birth; it is a veritable conservatory of the traditional arts: golden domes, carved wood, marble inlay… Personal objects of the former President are on display. In this museum, discover the richness of the ornaments, tunics and boleros embroidered with gold and silk, worn by the women of the Monastir region for special occasions.